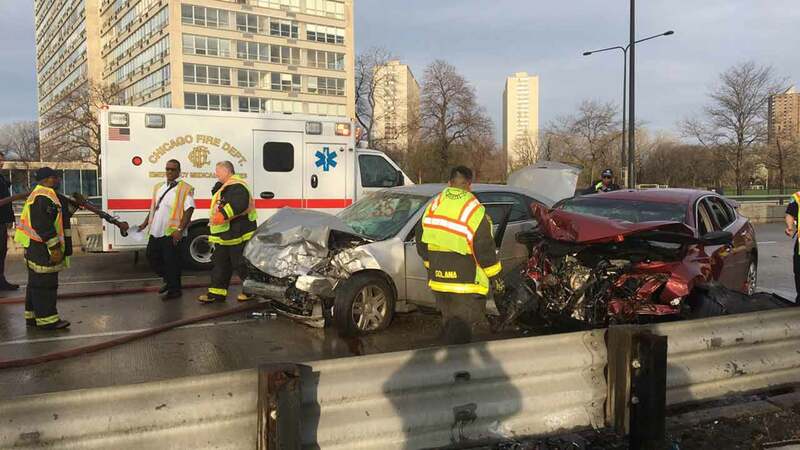 CHICAGO (WLS) -- A 39-year-old man was charged with driving under the influence of alcohol and child endangerment in a wrong-way crash on Lake Shore Drive that sent four people to the hospital. Roderick E. Smith, 39, of Oak Lawn, was traveling south in the northbound lanes around 6:45 a.m. Sunday when police said he struck another vehicle in the 4800-block of Lake Shore Drive in Chicago's Kenwood neighborhood. An 8-year-old boy was transported in critical condition to Comer Children's Hospital, where he stabilized. A 54-year-old man and a 28-year-old woman were transported to Northwestern Memorial Hospital in serious condition. A fourth person was transported in critical condition to Stroger Hospital. Police said Monday a mug shot for Smith was not available. He was charged with driving under the influence of alcohol and child endangerment, both misdemeanors. He was also cited for driving the wrong way on a one-way street, not wearing a seatbelt, driving without a license or permit and transporting or carrying alcohol.